YITIA(Yantai Information Technology Industrial Area)의 본부 역할을 담당하는 호텔, 빌라, 타운 하우스 및 아파트이다. 황해에 면하며 북측 바다로 향한 조망으로 무미건조한 높이를 개선하기 위해 다양한 높이의 인공지반과 남향 해변을 가진 인공 섬을 계획하였다. 섬은 호텔에서 바다를 향한 조망 요소가 되도록 하고 YITIA의 핵심 기능인 리조트 타입 스위트 호텔을 저층형으로 낮게 분산 배치하여 3개의 객실동과 1개의 공용시설 동으로 설계하였다. 28층 아파트가 단지의 랜드마크 역할을 담당하고 빌라, 타운 하우스, 호텔은 바다 전망을 최대로 고려하여 여러 각도의 저층형으로 배치하였다. 다양한 용도의 건물은 인공지반 높이에 따라 풍부한 공간감을 체험할 수 있다. 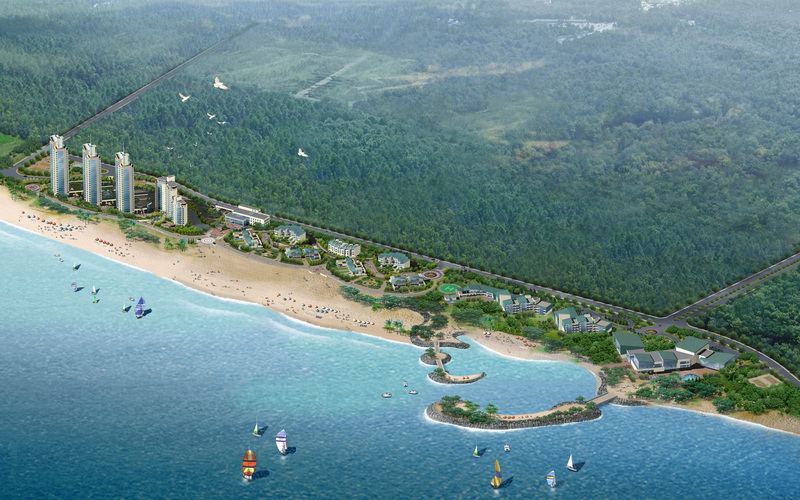 The project required design of the hotel, villas, townhouse and apartment that will serve as the headquarters of YITIA (Yantai Information Technology Industrial Area). To break the monotony of the flat shore, artificial ground of varying heights and a man-made island were planned, which will also provide an interesting view for the hotel. The resort-style suite hotels, the central function of YITIA, are 3 scattered low-rise buildings with one service building, and the 28-story apartment tower provides a visual orientation in the compound. The villa, townhouse and hotel are all low-rise, arranged for best ocean view. Buildings with different functions create unique spaces depending on the height of the man-made foundation. The design elements for the architecture, interior and landscape maintain consistency and harmony in artful variation.